While walking up the hill, we met our first “swindler” in Istanbul. A guy probably in his 20’s dropped a brush, Lauren picked it up and he thanked here. Then the scam began, he offered to shine our shoes. He claimed he was a student trying to get some money and we relented and let him shine our shoes. I offered a 20 TL (Turkish Lira) but he wanted more. All I had left were 50 TL so without thinking too clearly that it was roughly $35 USD I gave it to him and got my 20 TL back. Lauren also gave the guy a 5 TL and didn’t realize I was giving him so much money. He thanked us and was on his merry way, no doubt glad he just made his whole week in shoe shine sales probably! I like to think of it as my donation to charity while in Turkey! Kat wasn’t as amused but once the story got out it was quite an infamous story to the rest of the traveling group, so I had that going for me. My shoes were shining the rest of the trip!!! 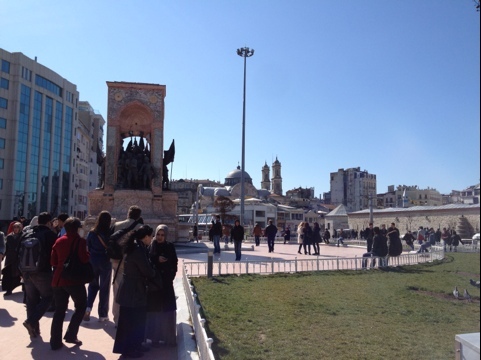 We decided to walk the 15 minutes back up to Taksim Square. 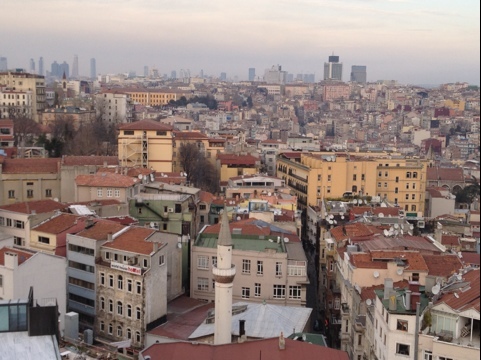 I had heard earlier from the professors wife that we should go back to the Galata Tower and go to the top to get 360 panoramic views of the city so off to Galata Tower we went. 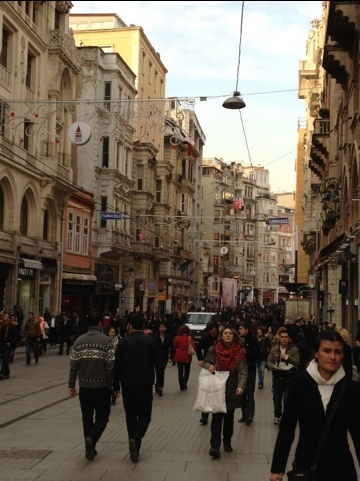 We walked down Istiklal Avenue where all the shops/food/bars/etc… are located. The street was packed at almost all times of the day and night. 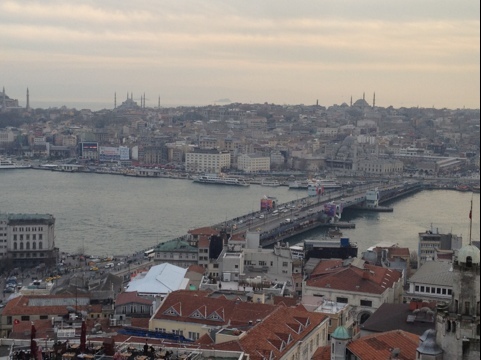 It took about 25 minutes to walk down the avenue to Galata Tower. It cost 12 TL to go to the top. Once there we took a good bit of photos. It was a great view. We finally walked back up the avenue to our hotel and waited for our respective spouses to return to the hotel. A good afternoon of sightseeing was in the books. 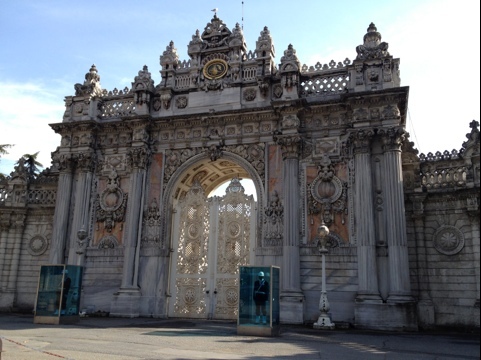 For dinner we were encouraged to go to the Ortaköy section of Istanbul down by the Bosphorus. One of Kat’s classmates is from Turkey and recommended we go to this area. He rounded up a bunch of cabs and off we went. I would say there was about 20-30 of us that went down to the restaurant area. Once there, groups split up and hit a few different spots. At the restaurant we chose, I selected chicken schnitzel and fries and Kat selected a meatball type dish kafte. The restaurant was super cheap and food was just ok that night. After dinner we went to the place next door because some people in the group wanted to try the hookah. 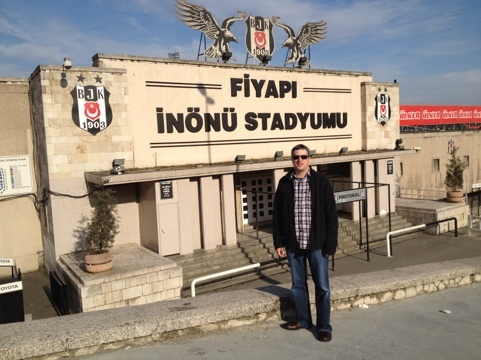 We were able to watch the Galatasaray/Sivasspor Turkish league soccer game and enjoy spending time with some of Kat’s classmates and spouses. Since everyone was pretty jet-lagged from the day before and staying out late on Sunday night, everyone decided to head back to the hotel relatively early (ie before midnight!) and Day 2 was over.